Welcome to Day #1 of Chocolate and Caramel Theme Week. 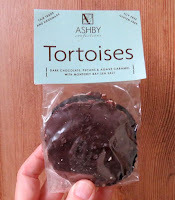 Today's Tortoises from Ashby Confections (Scotts Valley, CA) were wonderfully layered. 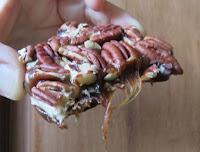 Between a disc-shaped layer of dark chocolate and a layer of pecan halves was a layer of agave caramel. And the Tortoises were seasoned with Monterey Bay sea salt. Bracing myself for lots of overly sweet and gooey caramel, I was pleasantly surprised. These variations on caramel turtles were well balanced and tasty. The layered flavors worked very nicely. The smooth dark chocolate, roasted pecans and sea salt balanced the soft, sweet agave caramel center layer, so you weren't left with a mouthful of sugar (thank you!). The caramel did contain cane sugar, agave syrup and organic cream, and behaved like authentic, gooey caramel—creating caramel "fangs" with each bite. 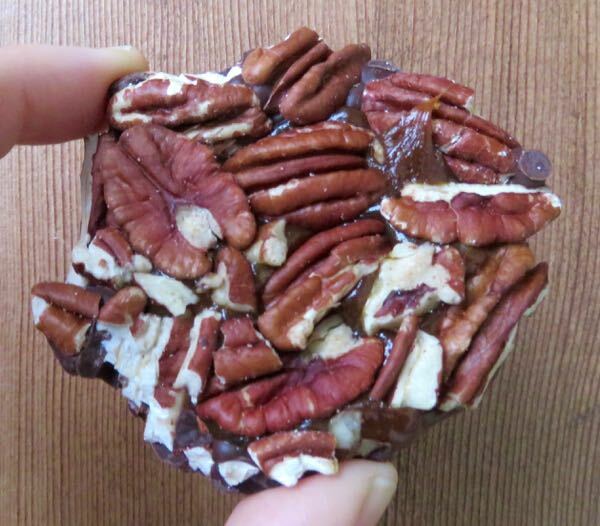 But, the combination of high-quality ingredients and the relative lack of sugar in the nuts and dark chocolate elevated this confection to a new level. These Tortoises were made with fair trade dark chocolate* and were gluten and soy free. *The company uses Guittard and Askinosie chocolate.